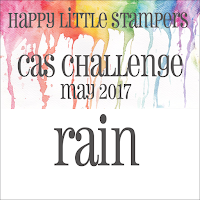 All the stamps I have used here are from the Happy Little Stamp set Rainy Days. I stamped the cloud/sun stamp straight onto the white card and then again on another piece of card. I fussy cut out just the cloud and then covered this in glitter-I thought the gliiter and the sun would hopefully bring a smile to whoever gets this card! 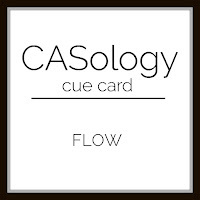 CASology-Flow-I looked up 'flow' and here I am using it as a noun-rain being the constant flow of water. Often I find I look up cue words and it really opens up your mind to the many possibilities-give it a try! This is FANTASTIC Sandie! I LOVE it! I like how the clouds are offset and glittery for some additional shine. A card to brighten up anyone's mood. Love your fun but stormy cloud. The yellow peeking out of the corner is a nice contrast against the grey. Glad you joined us at CASology this week. Sandie, you gave away my secret...I like to look up the definitions of the cue word at CASology to open my mind to lots of possibilities for cards! Great tip! 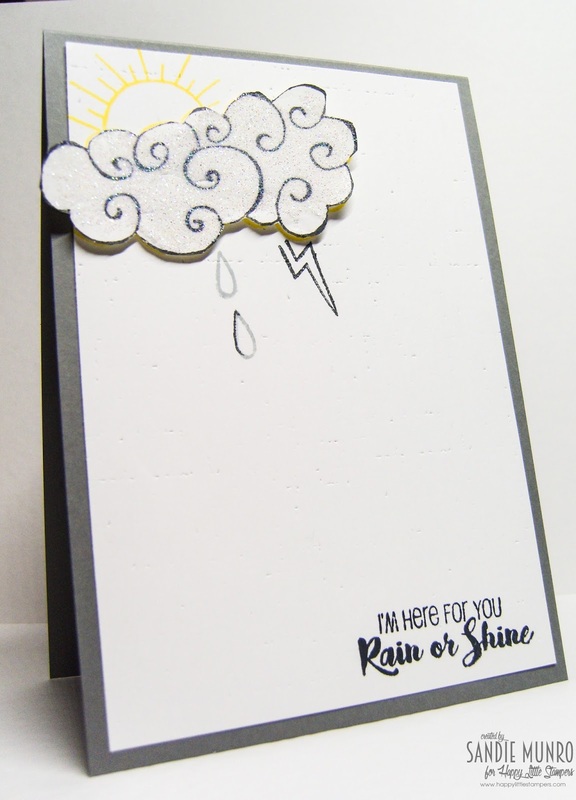 I love your idea of flowing rain/water for your card...and the glittery cloud is certain to brighten someone's day! Thanks for joining us at CASology! Although the card shows rain, it is a very cheerful and nice card. This is a perfect CAS card. Love that little pop of yellow you get from your sun! Thanks for playing along with CASology this week! This is CAStastic Sandie! From the the perfect colour scheme, to the visual 'flow' from image to sentiment, I think you have truly done this cue justice!! Really love that sentiment too! SO glad you could join us at CASology this week! 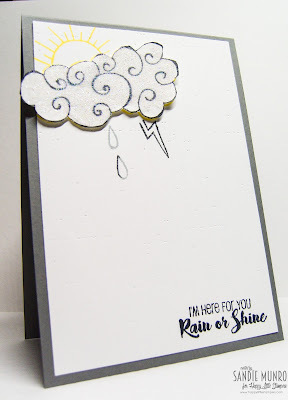 Sweet card Sandie - love those glittery clouds and the lightning just peeping through!